We welcome new trade accounts, just contact your nearest depot. Click here for locations, contact details, and new account application forms. by the TYRE INDUSTRY 10 times. B.I.T.S. are an official source for Debica a brand from the Goodyear group originating from Poland and one of Europe’s leading tyre manufactures. Check out Debica's new Ultra High Performance tyre the Presto UHP2 built with advanced technologies delivering confident sporty driving with increased mileage. Buy from B.I.T.S. online. Why not try on-line ordering. If you are an existing account customer and would like to register for on-line ordering and stock availability click here. If You are not an existing customer and would like to be, then please contact your nearest depot. 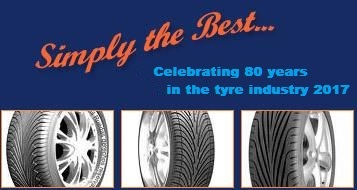 Tyres to the trade only - For general public, including businesses alike please visit www.county-tyres.co.uk where we have retail depots throughout 'The Tyre Group' of which you can order your tyres online and have them fitted at one of our branches. We are the only leading independent tyre wholesaler providing a comprehensive service throughout the UK. Which means we are able to give you the best choice, the best prices and the best customer service. Wherever and whenever. 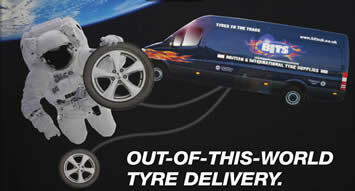 That means daily deliveries throughout the uk and the widest choice of products. Give us a call and see how far we'll go for you. No this isn't Tim Peake trying to add more British records to the book, but we do strive on our service to be out-of-this-world. Please click here for information on job vacancies.